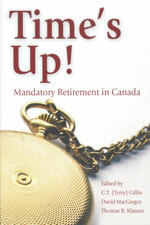 Manadatory retirement has become a major social and political issue in Canada. In this book expert authors explore the key themes that lie at the heart of the debate on this subject. Times' Up! offers new information and new insights regarding the complex dynamics underlying this controversial policy. Time's Up! appears at a watershed moment in the debate about this subject in Canada, and features contributions from emminent writers in economics, business, politics, and sociology.